Truck collisions are always dangerous, and flatbed truck accidents can be particularly devastating. Flatbeds are useful, since they're capable of transporting larger and heavier items better than enclosed tractor trailers. Unfortunately, this added heft may result in more serious collision injuries. Flatbed trucks are popular since they can easily transport items such as logs, huge pipes, manufactured homes, wind turbine propellers, and heavy machinery. While these trucks carry cargo, they don’t have walls or sides to safely hold it in place. If the truck’s cargo isn’t secured properly, it may shift forward or laterally, making the truck unstable and causing the driver to lose control. This can lead to a jackknife or rollover accident. Loose cargo may also slide directly into another vehicle or fall onto the roadway, striking or obstructing multiple vehicles. A truck driver is operating the vehicle under the influence of alcohol or drugs. The trucking company fails to properly screen drivers prior to hiring them. The driver or trucking company fails to perform routine maintenance checks. When a flatbed truck collides with a passenger vehicle, the car is likely to bear the brunt of the damage. Due to the extreme differences in vehicle height, a passenger car often ends up beneath the bed of the trailer. If you’ve been injured in a flatbed truck accident, or your loved one died as a result of such a collision, you need an experienced attorney to help you receive the compensation you deserve. 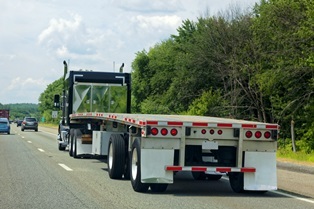 Flatbed truck operators must secure their cargo in accordance with state and federal regulations, conduct periodic safety checks, and abide by the rules of the road. Your attorney may be able to prove the truck driver or the company he works for breached duty of care by failing to fulfill all of these responsibilities.